After a long, bleak winter, spring is a welcome sight. Leaves return to the trees, and flowers grace the landscape. 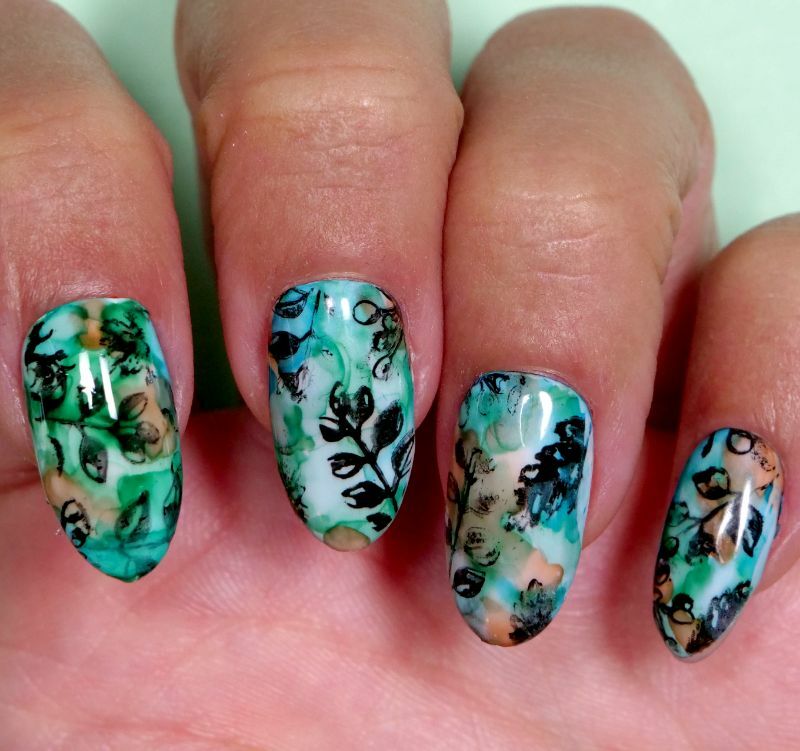 If you love all things flora, try using a stamp to add a botanical motif to your next manicure. This design combines spring-inspired foliage shades with a watery finish, so you can celebrate the season of renewal. To create a marbled effect, start with a white base, then apply alcohol ink in shades of green, blue and orange. This type of ink goes on like water, so the final design will have a sheer, see-through appearance. The black leaves are easy to apply— you just ink the stamper and press the design onto your nails. 1. Apply two coats of white gel polish to the nails. Cure between coats with the UV or LED lamp. 3. Place a drop of green alcohol ink on a pad of Extreme Post-it notes. 4. Pour isopropyl alcohol into a glass jar or dish. 5. 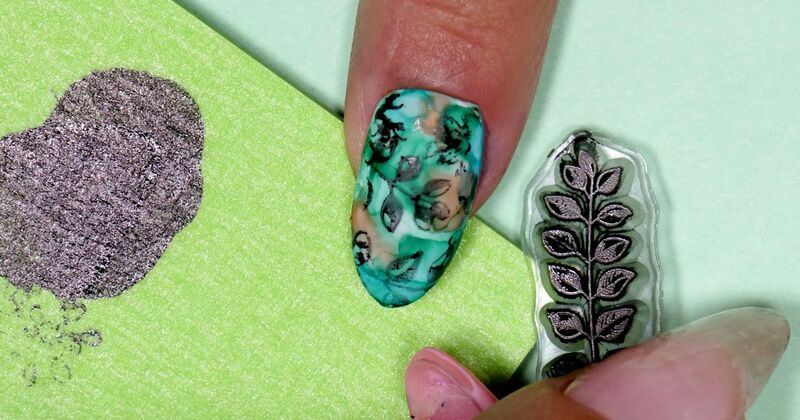 Dip a nail art brush into the alcohol, wiping the excess liquid onto the Post-it pad. Drag the brush through the green ink slightly, then paint wavy lines on your nails. Build up the color by applying additional ink, as desired. 6. Clean the brush by wiping it on a paper towel. 7. Add orange ink to the Post-it pad, and repeat step five. 8. Clean the brush again. Repeat step seven using blue ink. 9. Apply a drop of black ink to the Post-it pad. Dip a disposable lip gloss applicator into the ink, then transfer the ink to the leaf stamp. 10. Press the stamp against the nail to deposit the design, then repeat, as desired, on the other nails. Cure the ink with the lamp. 11. Protect the design by applying a layer of no-wipe gel top coat, then cure the polish. Now, you can carry a touch of nature with you everywhere you go. Stay pretty, and please share this nail tutorial on Facebook.